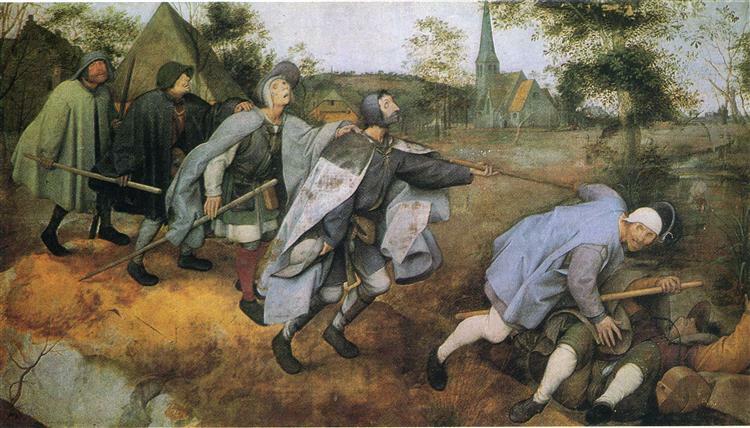 The Fight between Carnival and Lent depicts a common festival held in the Southern Netherlands. 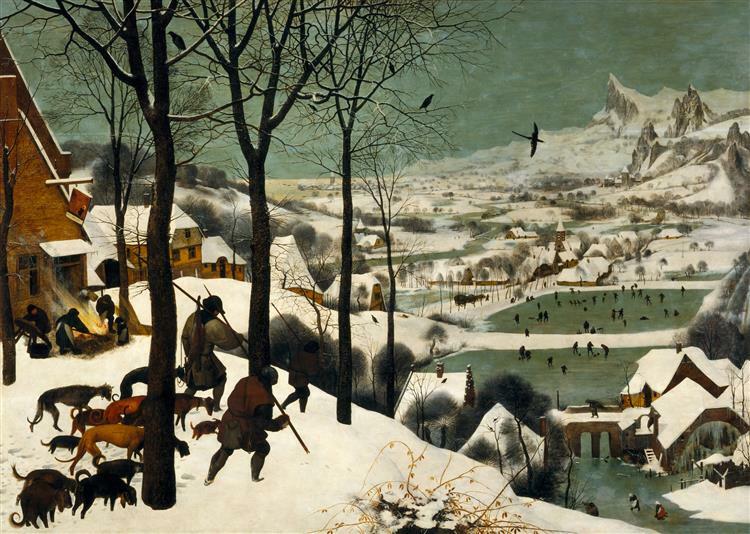 On the left side of the painting there is an inn, and in the right side of the painting there is a church. The juxtaposition is meant to illustrate the two sides of human nature: pleasure and religious chastity, and the contrast between the two. Near the church sit well-behaved children. Near the inn are rambunctious drunkards. The fat man in the middle of the painting, with the pie on his head, is a representation of “carnival.” The painting represents a common theme in 16th century Europe, the battle between Carnival and Lent, and with its humor and witticism, is a satirical critique on the conflicts of the Reformation. 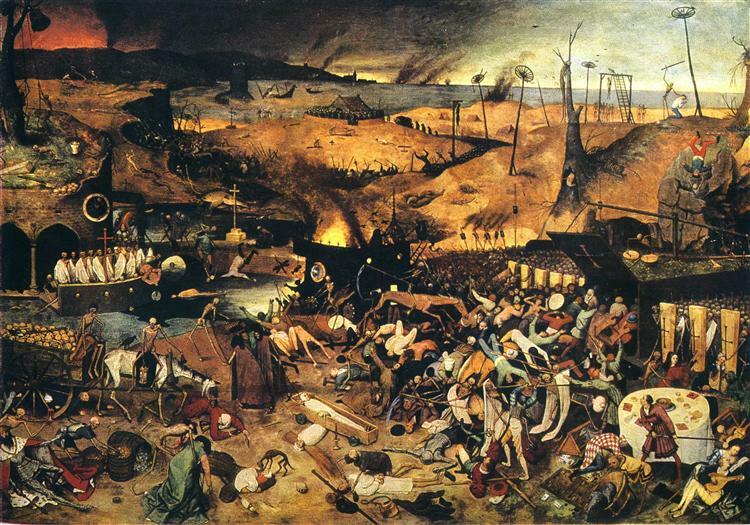 The Fight Between Carnival and Lent is an oil-on-panel work painted by Pieter Bruegel the Elder in 1559. 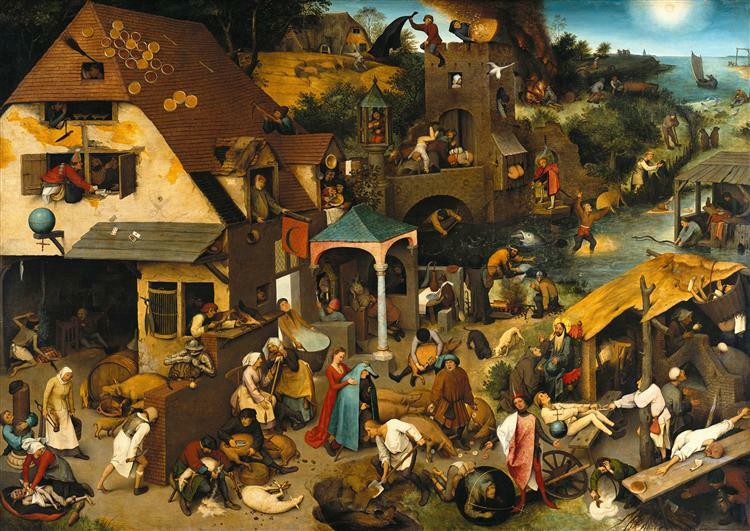 This painting depicts a common festival of the period, as celebrated in the Southern Netherlands. It presents the contrast between two sides of contemporary life, as can be seen by the appearance of the inn on the left side—for enjoyment, and the church on the right side—for religious observance. The busy scene depicts well-behaved children near the church and a beer drinking scene near the inn. At the centre is a well, showing the coming together of different parts of the community, and other scenes show a fish stall and two competing floats. 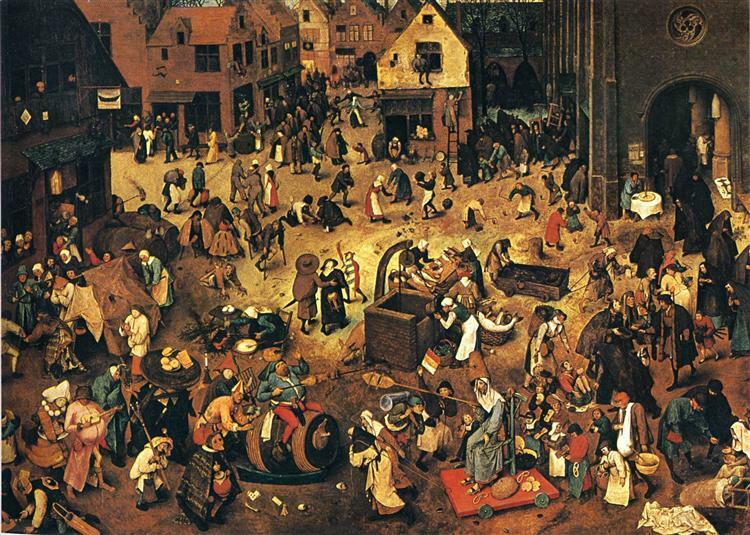 A battle enacted between the figures Carnival and Lent was an important event in community life in early modern Europe, representing the transition between two different seasonal cuisines: livestock that was not to be wintered was slaughtered, and meat was in good supply. As the period of Lent commenced, with its enforced abstinence and the concomitant spiritual purification in preparation for Easter, the butcher shops closed and the butchers traveled into the countryside to purchase cattle for the spring. 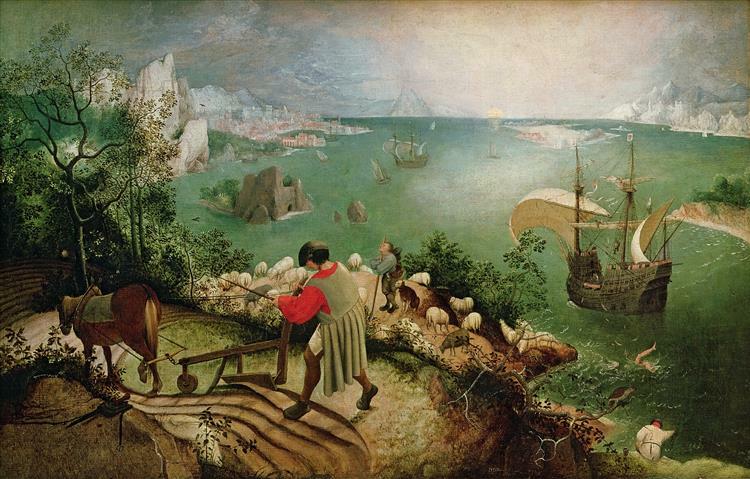 Bruegel's painting is rich in allegories and symbolisms that have been long studied. It is often read as the triumph of Lent, since the figure of Carnival seems to bid farewell with his left hand and his eyes lifted to the sky. 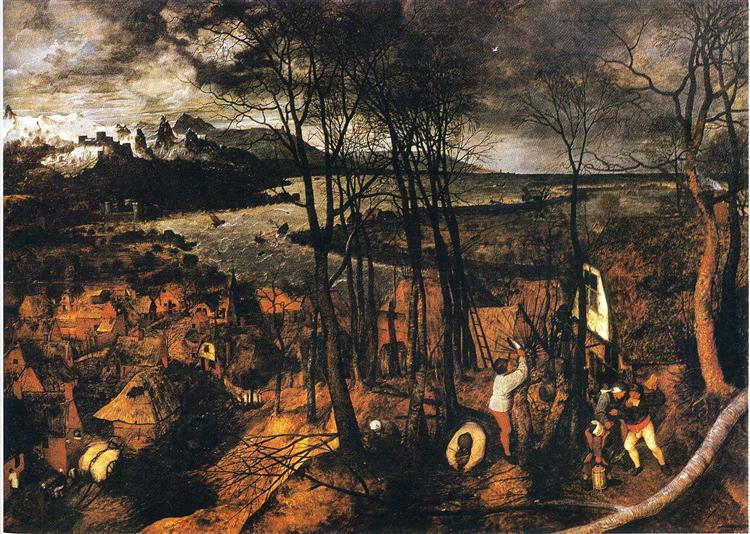 A more generalised meaning may be the illustration of Bruegel's belief that human activities are motivated by folly and self-seeking. The painting defies any linear narrative, but one may divide it into two sections: the popular and the religious. The scene is set in a town's market square (a traditional setting for the Carnival), with the figure of Carnival impersonated by a fat man who led a procession through the town and presided over a large feast. In some traditions an effigy of the Carnival figure was burned at the end of the celebrations. 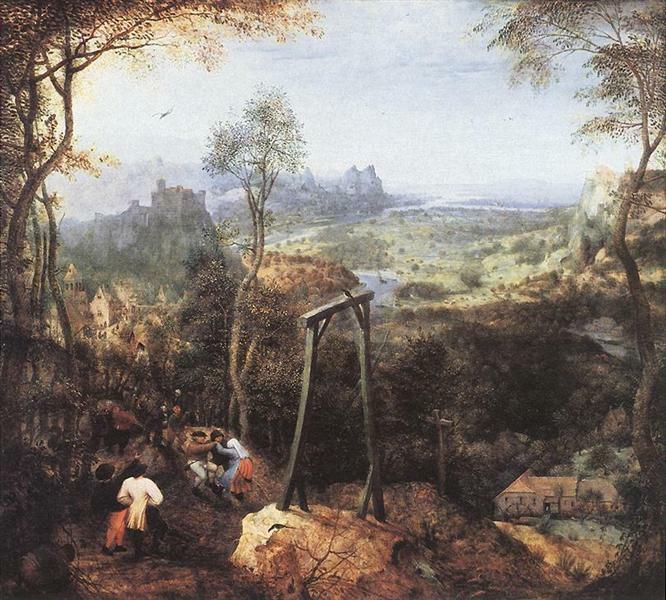 In Bruegel's painting the figure is a large man riding a beer barrel with a pork chop attached to its front end. He is wearing a huge meat pie as a head-dress; he is wielding a long spit, complete with a pig's head, as a weapon for the fight. The pouch of knives at his belt indicates that he is a butcher—the guild of butchers traditionally provided the meat for the carnival feast so his place at the procession's heart is apt. The man behind the barrel is dressed in yellow, which is connected with deceit, and he is followed by a female figure who is carrying on her head a table with bread and waffles on it. In one hand she holds a tumbler and in the other a candle, again allegorical symbols for deceit. Beside her is a lute-player, which was a frequent symbol of Lutheranism. The Lutherans had abolished Lent but still celebrated the Carnival. A tavern filled with drinkers and onlookers watch the performance of a popular farce known as The Dirty Bride. At the street crossing a group of cripples have come out to beg, while behind them, led by a bagpiper, a procession of lepers walks past.